The Earl of Thomond is an award-winning restaurant of international renown. Elaborately decorated with oak wainscoting and other formal features it offers a relaxed but elegant dining experience featuring innovative cuisine served with tradition and a hint of creative flair. Every detail is attended to, from the use of locally sourced, quality-assured produce to customized wine recommendations from the sommeliers. 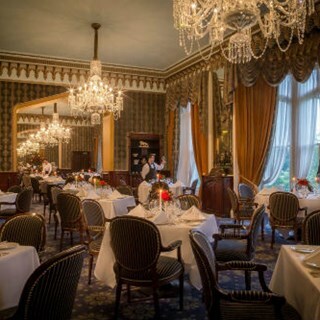 A la carte, five-course table d’hôte and vegetarian menus are available. I booked afternoon tea as a belated Mothers Day treat for my mother and birthday treat for my sister. Everything was excellent. The staff in particular were lovely, friendly and helpful. I wasn't sure if the atmosphere would be a bit stuffy, but it wasn't at all and we had a lovely time. Thoroughly recommend it as a treat. 5 star service as always! 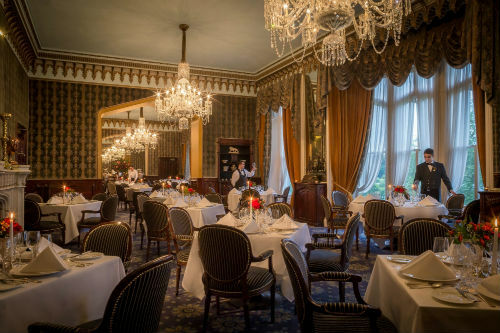 Dromoland really pride themselves on their service and that is why I keep returning. The afternoon tea experience is always wonderful, very attentive staff with a delicious choice of food. By far the nicest afternoon tea and this time I upgraded to the champagne afternoon tea which is well worth the treat. The piano is a wonderful addition which really adds warmth to the experience. That was my fourth time visiting and I'm already planning my fifth. Really lovely relaxing experience for Afternoon Tea. Plenty of food was served and anything left over, we were supplied with a box to take home. Staff were very professional as well as friendly and informative and made sure we were comfortable at all times. This was a magical experience from the moment we arrived. The service was excellent and the staff was warm and friendly. The dinner was delicious and the music of the harp was the icing on the cake! We had the tasting menu for our meal and it was delicious! The staff was great, especially Danielle she was the best!! We had afternoon tea. The service was impeccable and the food was excellent. Staff are extraordinary in service and helpfulness. Very kind and friendly. Nothing was too much trouble. They let me sit in front of fireplace and surprised me with a birthday cake. Can't recommend highly enough. Top notch service from parking the car to dessert. Great care was taken by everyone to give my wife and I a tremendous experience. Food was excellent. Atmosphere was exquisite. We were treated like royalty. We would definitely recommend this experience for everyone. Thank you. Service is outstanding. It was the best Mother’s Day ever! Wonderful meal and I would highly recommend . Staff were so friendly and attentive. We had such a lovely evening. The food was so yummy and no shortage. We had afternoon tea and it was simply lovely! The service was excellent, the staff was friendly and helpful, and the food and tea were delicious. Everyone was especially kind with the children, and the whole experience was a highlight of our trip! My dining experience was lovely only slight comment food beautiful but could be a little warmer other than that very nice. Staff so helpful and courteous first class. Thank you. It was an unbelievable experience, but too short of a stay for us to fully enjoy the many activities and options. Look forward to another, longer stay in the future at this magnificent property. Great and snjoyable experience. Well worth this visit. Really enjoyed our afternoon tea and the service was exceptional. Will be back! We had a very enjoyable evening being looked after by great staff. Helpful in every way.